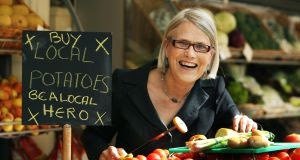 Darina Allen, co-founder of the of the Ballymaloe Cookery School in Shanagarry, County Cork, Ireland, is #38 on the list of 50 Women Game Changers in Food. She is the author of several cookbooks and has been called "The Julia Child of Ireland". velvety smooth texture. It's amazingly simple for a weeknight meal and yet elegant enough for your guests. Definately a keeper! Uncover the pan and discard the paper. Pour in the stock, bring to the boil and simmer until the vegetables are just cooked - about 5 minutes. Do not overcook or the soup will lose its fresh flavour. I reallllly needed this soup to go with my brown soda bread. Leeks, potatoes and cream are a match made in heaven! I'm glad you made this soup! It was one of the dishes that I was looking at! I know I'll be making this soup soon! You're right ... it can go from the kitchen table with a slice of brown bread to the dining room table as a first course in a multi-course schmancy dinner! Wow! What a wonderful Lent recipe. I bookmarked it for later. Thanks for sharing with us. I love potato leek soup and this one sounds fabulous! We've got many good bread recipes this week to go with it. I fondly remember having Potato Leek soup in almost every pub we visited while in Ireland...served of course with soda bread! Great choice! It looks simply delicious! It sounds so perfect for this time of year, some good Irish comfort. The first time I had potato leek soup was a vichyssoise. I was 9 or 10 and I felt so adult. Delicious hot or cold!